Towards collaborative mat-hybrid housing. An experience for Co-lab. This is a small non-linear story gathered between Virginia Woolf’s own writing room and Perec’s shared species of spaces as imaginary. I was born in Madrid, the city of las corralas, a place filled with common spaces and “streets in the sky”. At the age of 7 I drew houses and trees planted on bridges with (permanent) coloured pencils on the walls of my parent’s house… I understood then that my thing was a “mind-hand-pencil” connection. In summer 2005 near Liege, I discovered the Belgian Béguinages and their development. Five years later I was lucky enough to discover Argentina thanks to my parents, where a friend took me to an intensive workshop at the NGO Un Techo para mi País. At that time, they were developing low-cost growth houses entirely built in a wooden structure (Ballon frame) at the outskirts of Salta. During my stay in Argentina, a 5-year-old girl named Ana brought me a cold milk glass with a smile on her face while I was helping to set up the wooden piles of her future home. There I understood that architecture was my passion, not only for the knowledge I had acquired but also for its impressive social background. I liked the idea of contributing with proposals, ideas, projects for those who needed them the most in order to create something necessary as a home or a “minimum living sphere”. In the middle of the economic crisis in Spain (2008), I decided to do Architecture out of absolute vocation and passion…it was my 1º, 2º and 3º choice on the list. I started the race in 2009. Visits to Bijlmermeer in Amsterdam, Barbican in London, “El Taray” Cooperative Pío XII in Segovia or the shared kitchens and common living spaces of Bari Vecchia, among other projects, inspired me in different ways to conduct my future research. After almost 6 years of Master Degree in Architecture…my Final project was focused on searching for alternatives and mutable experimental housing with shared common spaces to be developed in the Poblado Dirigido de Fuencarral (Madrid, Spain). That same year (2015) I was awarded a scholarship for academic record by ARQUIA (Fundación Caja de Arquitectos) and gained a professional internship at EMBT (Enric Miralles Benedetta Tagliabue). Working in Barcelona I understood the importance of organization, consensus, creativity, but above all the need for a future revolution. In my opinion, this revolution is linked to the infinite and impressive world of research. Before finishing the final project I was already thinking about it…I got several research fellowships during my studies so a year later I enrolled in the Doctorate part time as I was working in Madrid also part-time in an architectural studio, working on social housing on one hand, competitions with friends on the other and collaborating as an assistant in classes about architectural projects at the university, all this dividing myself between competitions and congresses, with many lost attempts and some achieved. So I became the co-author of the 1st Europan Prize (E14 in La Bazana) aimed at reactivating a rural area in Extremadura through a cooperative. In this research journey I have also participated in several congresses on Architecture and Gender (MORE or MoMoWo in Turin). In 2015/6, the Ministry of Education, Culture and Sports (MECD-Spain) awarded me, on the basis of academic and professional merits, a four-year contract to do my PhD (FPU-MECD 2015). Without this award, it would have been very complex for me to do the PhD with constancy and continuity, rigor and depth. I didn’t have anyone in the family who needed a new house ironically talking and the construction sector was absolutely stagnant in Spain at that time…but I had energy, some ideas and a lot of desire to learn of course. During the PhD, currently in progress (deadline: June 2019) I’ve read, among others, Liisa Horelli, D.U. Vestbro, Dolores Hayden or Giancarlo De Carlo, who advocated participatory architecture. The starting point of my PhD was the approach linked to the concept of “collaborative infrastructures” and ‘mat-hybrid housing‘. I learned about the Baugruppen experiences in Germany on a trip to Berlin in 2016 as part of the first part of my thesis. 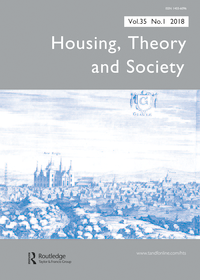 In addition to the cohousing experiences of Northern Europe, all part of the fieldwork of my doctoral thesis. Conducting two research stays, one at the Architectural Association in London (2017), and the other at the IUAV in Venice (2018), to consult archives and housing projects on site. In June of this year (2018), I was lucky enough to take part in the workshop “Collaborative Housing” in Uppsala, created by Darinka Czischke. In Sweden, at ENHR, Sara and Darinka offered me to write a little piece for Co-lab as a collaborative constellation of experiences and there it is.